Despite the growing amount of research in link and type prediction in knowledge graphs, systematic benchmark datasets are still scarce. In this paper, we propose a synthesis model for the generation of benchmark datasets for those tasks. Synthesizing data is a way of having control over important characteristics of the data, and allows the study of the impact of such characteristics on the performance of different methods. The proposed model uses existing knowledge graphs to create synthetic graphs with similar characteristics, such as distributions of classes, relations, and instances. As a first step, we replicate already existing knowledge graphs in order to validate the synthesis model. To do so, we perform extensive experiments with different link and type prediction methods. We show that we can systematically create knowledge graph benchmarks which allow for quantitative measurements of the result quality and scalability of link and type prediction methods. 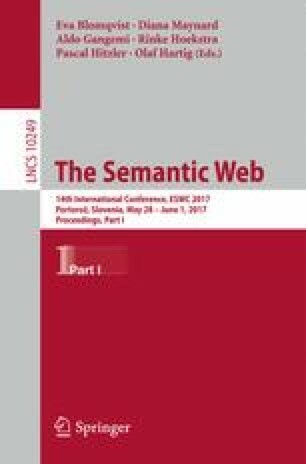 The work presented in this paper has been partly supported by the Ministry of Science, Research and the Arts Baden-Württemberg in the project SyKo\(^2\)W\(^2\) (Synthesis of Completion and Correction of Knowledge Graphs on the Web).